Image from impawards.com Poster design by Empire Design. The story is about two women who are best friends already for years. 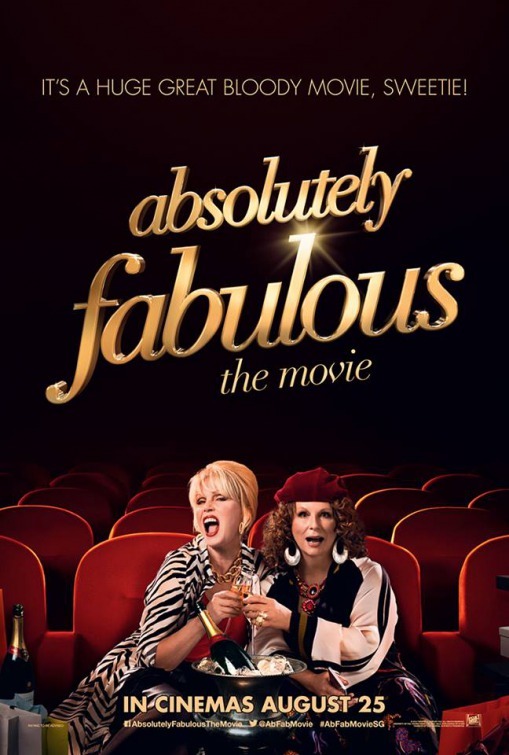 There has been a television series about ‘Absolutely Fabulous’ previously to this film. The series started in 1992 and the last episode – season 6 episode 3 named ‘Olympics’ was broadcasted on 22 July 2012. Those two women named Edina and Patsy love living life, taking the best out of it and sometimes in a little dumb – but that’s the comedian – way. The main characters are Edina and Patsy, the two crazy women and best friends. They live together…or to say…they live at someone’s house. Other important characters are Saffy, the daughter of Edina, and Lola, the granddaughter of Edina. Edina has a personal assistant named Bubble and she reminded me of a character in the film ‘The Hunger Games’. It is always fun to have such a character in a film. The rest of the characters have smaller roles but in the list below you see how many famous came by in just this single film! If you loved the series before, lots of fun guaranteed is my opinion. Dank voor uw reactie! Ja ze heeft in ‘The New Avengers’ / ‘De Wrekers’ (1978/1979) gespeeld als ‘Purdy’, samen met ‘Gambit’ het maatje van ‘John Steed’ inderdaad. Ook leuk om zoiets te ontdekken :). Maar ik ben van mening dat de doelgroep heel breed is hoor haha, als je maar van een beetje goede gemoderniseerde oude comedy houdt.